The Senior Boys lost to Fort 64-28. “We were down 36-17 at half which is a very big hole to try and come back from” said Coach Lalonde “We need to take care of the basketball and produce more shots instead of turnovers. We have a couple of guys still to tentative with the ball and not looking to be offensive minded enough. We were did a better job defensively in the second half and it is an area where we will continue to get better.” Jared MacKinnon had 7 and Kevin Gardam had 6. 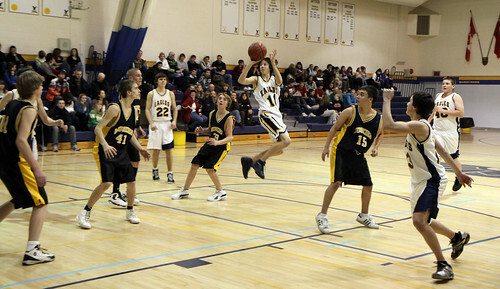 The Junior Boys basketball team fell to the Muskies 68-27. The Junior Girls Volleyball team also took the day in three sets (25-20, 25-19 and 25-9).